Firstly, I would like to credit UpLateAnyWay.com for the inspiration of this recipe. This is a variation on the Almond Flour biscuits they have created with a few twists. Check that site out, they come up with a ton of great Keto recipes! I’ve been experimenting with different Keto biscuit recipes over the past few weeks and this recipe is the culmination of many failed attempts(and a lot of taste-testing!). I present to you the Ultimate Keto Cheddar Jalapeno Biscuits! I wanted to recreate the infamous “Cheddar Bay Biscuits” from Red Lobster without the carbs, but with all the flavor. Truly a daunting task as Red Lobster’s biscuits are the definition of perfection in every way. If I had to choose between a night with Scarlett Johansson and a bakers dozen(“bakers dozen” is a vastly underappreciated concept) of CBB’s, I’m probably going Scarlett, but I would think about it for at least 30 seconds first. I channeled my inner Southern Grandma on this one and kept the ingredient list to just the basics, with a few things thrown in for added flavor. It’s easy to add a bunch of crazy ingredients to cover up for an inferior biscuit, but luckily for you, I’ve tinkered around with the recipe for the dough enough to come out with a great tasting Keto Biscuit that can stand on it’s own. Let the biscuit do the talking! You guys are creative though, so come up with your own ideas. Reply back here if you come up with something good so we can give it a try! I went with a classic Cheddar Jalapeno version this time. I also decided to add a Basque Fryer pepper that I picked up from the local farmers market. 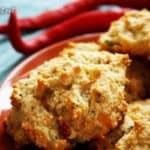 It’s a very mild pepper that adds a unique peppery flavor to the biscuits, less spicy than a Jalapeno. Honestly, I knew nothing about it until I got home and looked it up online, but it looked good so I grabbed it. I was a bit dissapointed to find out it was called a “Basque Fryer”. That’s pretty much the weakest pepper name you’re likely to come across. Habanero, Jalapeno, Poblano, Basque Fryer.. Can we revoke pepper naming rights from the french? These Keto Cheddar Jalapeno Biscuits went great with the rack of pork spare ribs I made for Sunday Dinner. I had the ribs in for 3 hours and put the biscuits in for the last 20 minutes, so everything came out hot at the same time! 3g of net carbs each! Leave a few tablespoons of butter out and let it warm up to room temperature. Cut open the Keto Cheddar Jalapeno Biscuits while they’re still warm butter them up and enjoy! Preheat oven to 350 degrees and place butter in the fridge to ensure it is cold when we need it. Mash your butter into the dry ingredients until you achieve a sandy consistency. Add the cream and egg and mix until together. Fold in cheese, jalapeno and parsley. Form 6 medium sized balls and place on a silicon baking mat or a cookie sheet.